A while ago I was lucky enough to get sent a drinks cup from Denny's by Pete Murray. 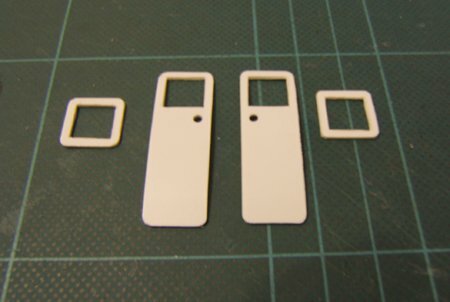 Step two, cut out a pair of doors & window frames from .30 plastic card for detailing the body and stick them on with superglue. 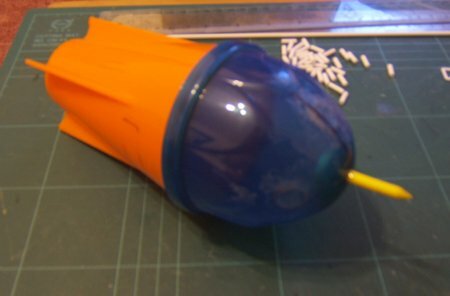 Step three, taking some plastic tubing, cut lots of 10mm lengths, then superglue them around the body as rocket ports. Once finished have a strong drink to settle the nerves! 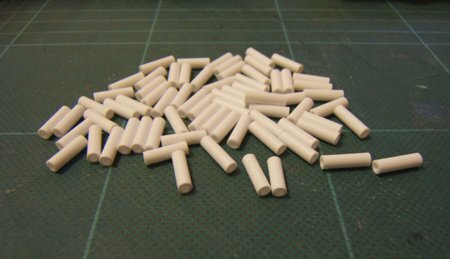 The tubing is 1/8" / 3.2mm styrene tubing from Plastruct. It took two lengths to cut enough pieces, with some spares left over afterwards. 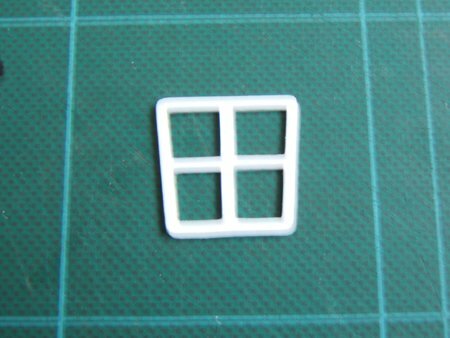 Step four, cut front windows frame from plastic card. This needs to carefully curved to apply it to the rounded surface. Step five, wing stubs. 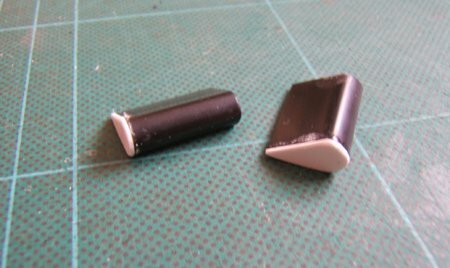 Taking a rounded slide binder (used to hold papers together), cut two 25mm lengths, glue the open edge together then cut end pieces and stick them on the outer ends (inner ends will stick to hull). 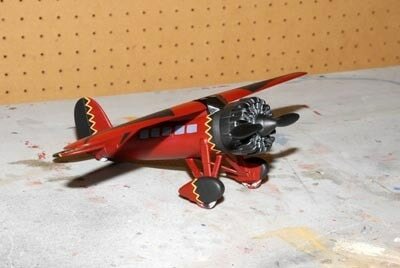 Step six, all construction complete, paint. 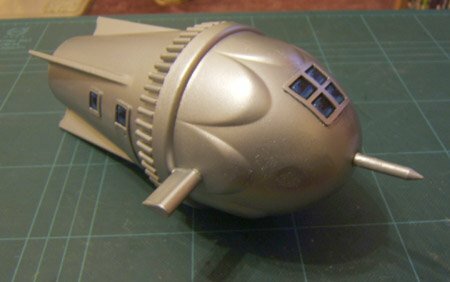 I decided on the classic silver scheme, spray with a can of Tamiya silver for polycarbonate (to make sure it covers the plastic ok) Next paint in windows & edge doors etc. Final ship next to figure for scale. 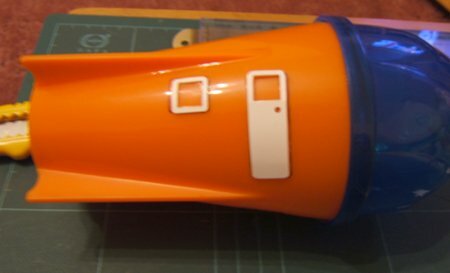 Step seven, I finally gloss varnished the ship to protect the paintwork as I wasn't sure how the paint would hold onto the plastic cup surface. Once again, thanks to Pete for the cup! 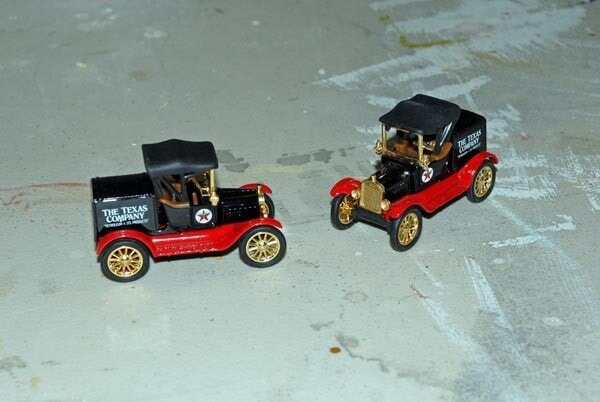 I picked up a couple more 1918 Ford Runabouts like the one I painted up before at one of the "Antique" shops that rents out space to sellers. These two however will be painted and converted. 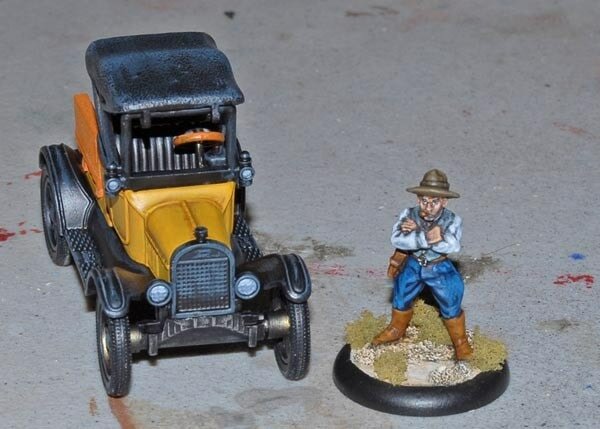 One will be a Pickup with a yellow body and bed and black fenders. The other one will have a bigger wooden bed with tall sides. I may even remove the back fender and push the wheels farther back if I think I can manage it. 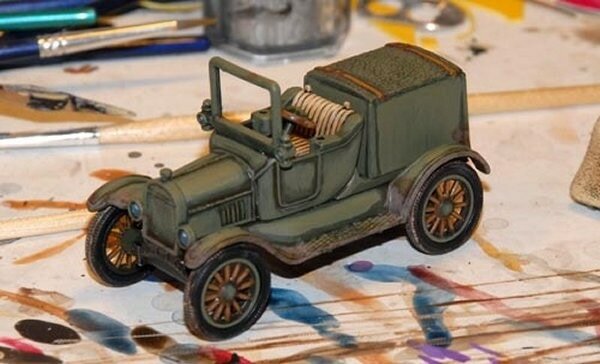 The bigger truck will be grey and more heavily weathered with rust spots and more caked on mud. I'll do the yellow truck first. 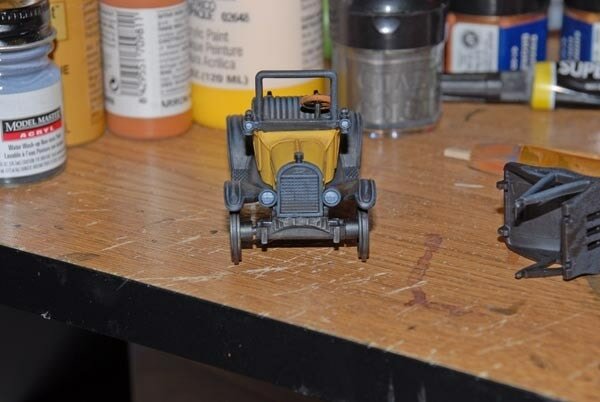 I got the trucks all stripped and primed and started work on the yellow pickup. 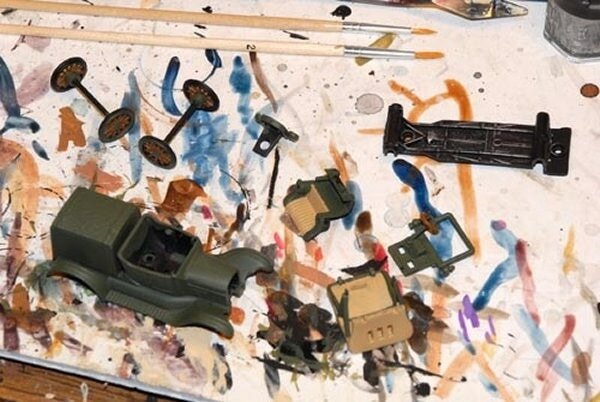 First I painted the body yellow. This took several thin coats. 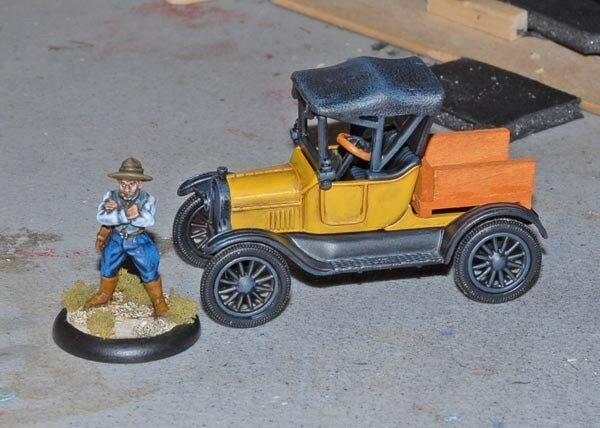 Next I used a dark brown wash on the yellow areas. Then I highlighted the yellow areas. Finally I highlighted the black and added a few details. I've decided to make the bed of the pickup out of wood so I'll make that next. I’ve made a simple truck bed out of basswood. I left the gate off so I could load the back with different items depending on what I wanted. I'm going to stain it the same color as the steering wheel. It's basically finished. Here are a few snapshots. I'm pretty happy with it and I think it will make a nice addition to my games. There were several occasions in my Ars Magica campaign when the characters made journeys to the Underworld and used the facilities offerd by charon, the boatman of the River Styx. 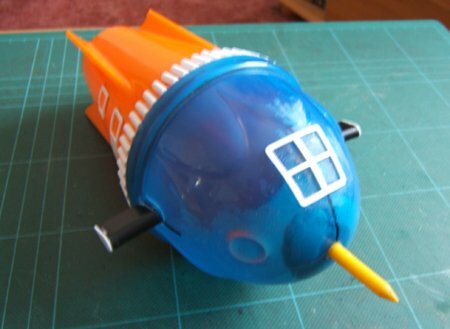 One day, and I can't remember why, I decided it would be a really good idea to build his barge. 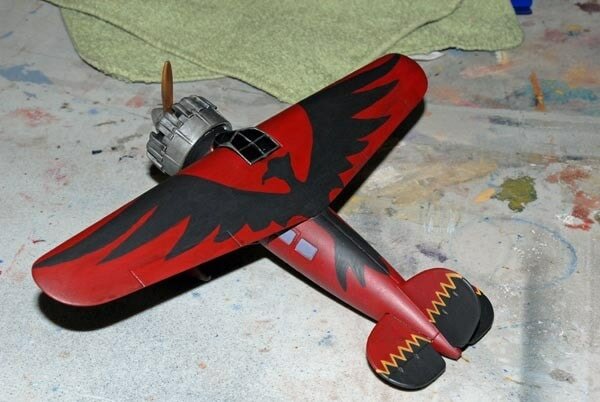 It only took a day to make and paint it. 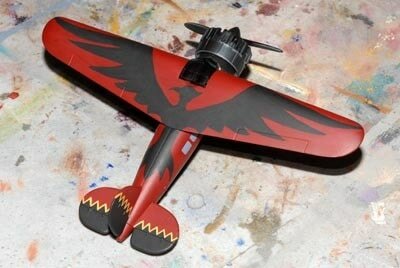 The main body is made from balsa wood and the rest is plasticard and things from my bits box. I had a load of ship parts that I'd collected for a big pirate ship that never got finished so these were the first things to be pressed into service. The lanterns fore and aft are brass ship fittings and the rails down the side are plasticard mounted on wooden ships railings. The little standing lights by the steps are made from mapping pins and a clear bead. the big skulls on the side are a metal badge, there's a different one on the other side. The hanging skeletons were bought from the same shop and are ear rings. There are a lot of skulls and bones which are shield devices from the Games Workshop skeleton box set, easy to use because they're flat on the back so you can just stick them down where you want them. 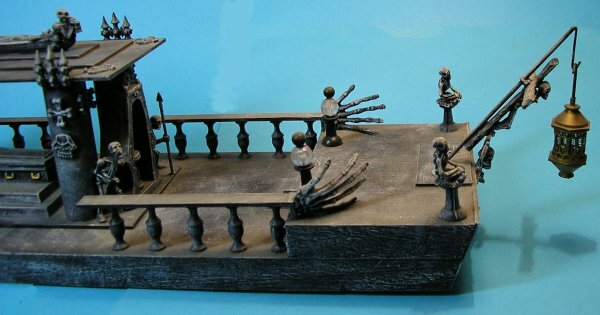 This box set was a very worthwhile purchase as it provided full skeletons and seperate skulls as well for other parts of the barge. 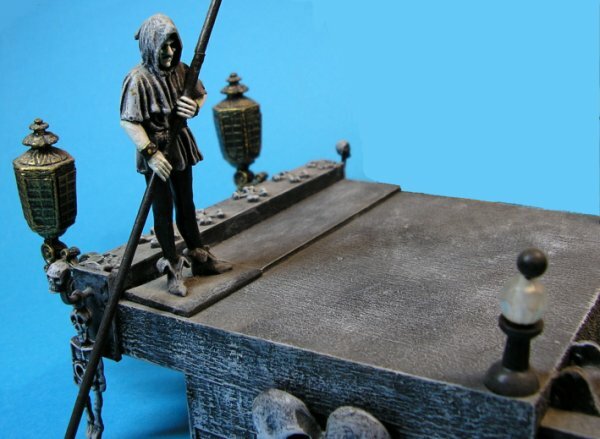 Charon himself is a 54mm figure from a company called Sanderson (I think). They made figures, several based on Frank Frazetta pictures, around the end of the 70s. I don't think they're still going. This figure was originally an executioner and had an axe. I removed the axe head and extended the pole in both directions with brass rod. 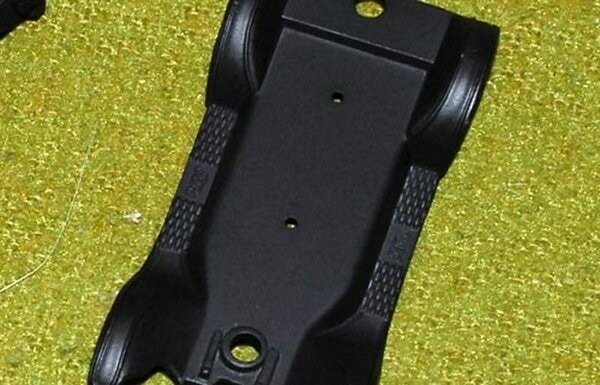 You can see the join in this picture. 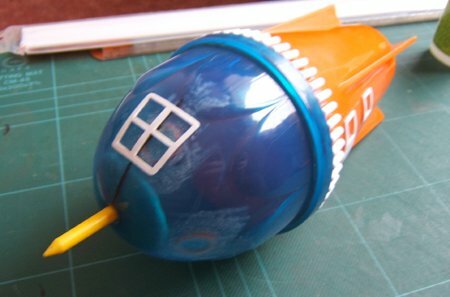 I made this in 1998 and wasn't as skillful as I am now. I topped his pole with a GW skeleton head. The figure was on an integral base which I didn't want to bother removing (I didn't have the tools to do it either) so I added a strip of plasticard to make a ledge across the width of the barge and disguise the base. 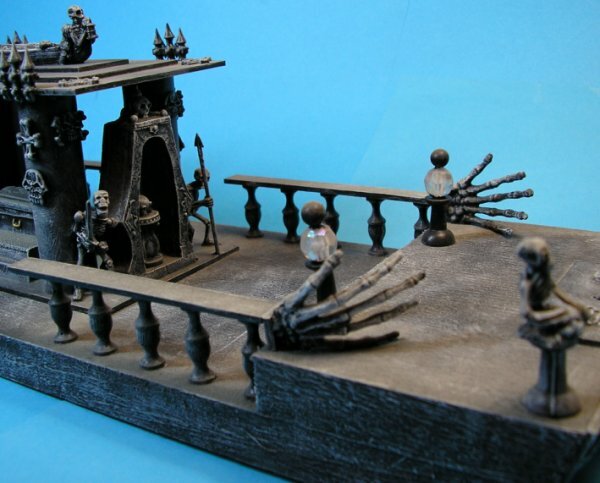 The centre structure was made from plasticard, four plastic cyliders from till rolls and many GW skeleton bits. 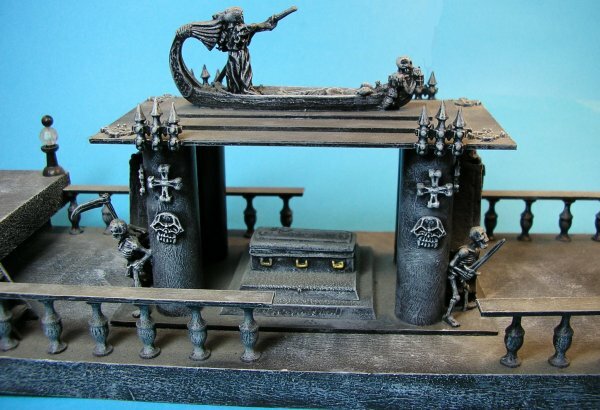 The coffin is from Rafm and is on a plinth made from GW bases. 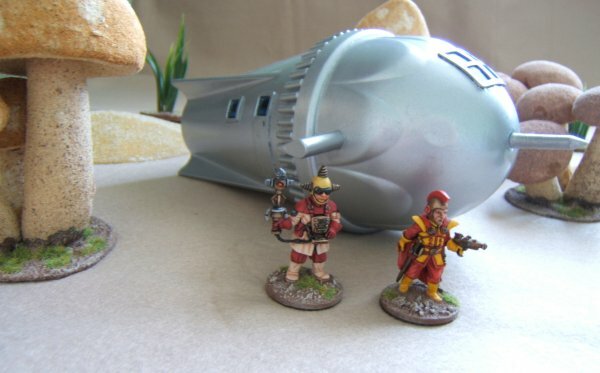 The roof ornament is from Grenadier and was the original figure I used for Charon in my games. The ends of the centre structure are filled with an archway that a Rafm liche used to stand in and a Mithril Miniatures palantier. There is another set of these at the other end. The big hands that I used to cap the railings are from an Airfix skeleton kit. The front skeletons are metal and come from Ellerburn Armies. The seated ones are on mapping pins again and the crucified one is held in place by brass rod. the front and back of the barge, where the wood grain was exposed by cutting have been capped with plasticard to give a smooth finish. 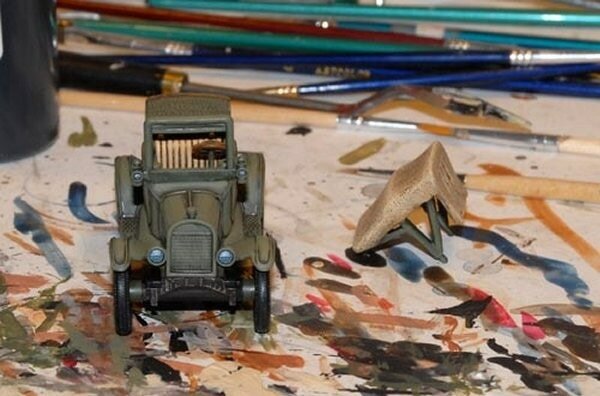 Everything was painted black and drybrushed with a couple of greys. Charon was painted in black and grey with pallid grey-green skin. Tiny bits of brass were added in places and that was that. 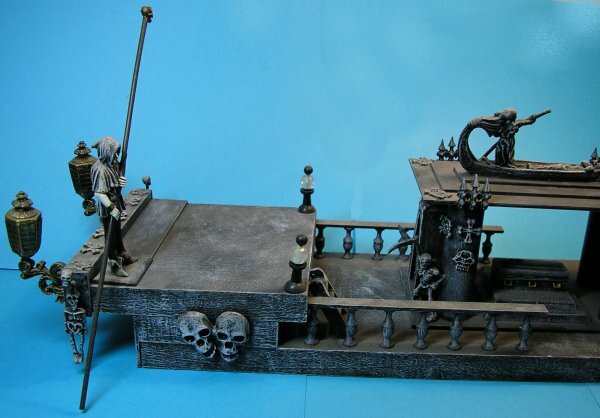 A suitably gloomy and creepy conveyance for the River Styx. The barge is 100mm wide and 400mm long. 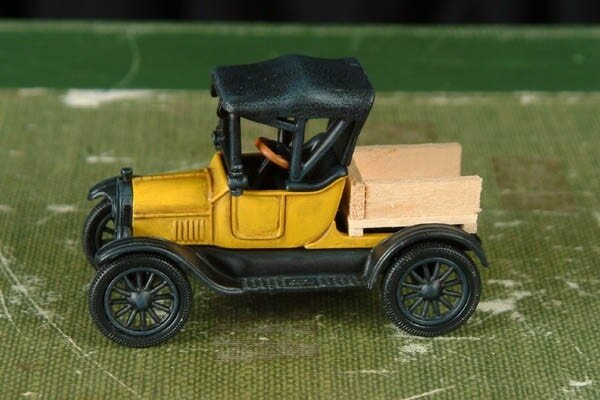 I picked up this truck today at a junk shop, a 1918 Ford Runabout. It even came with a nice little tin for transport and all for eight bucks. 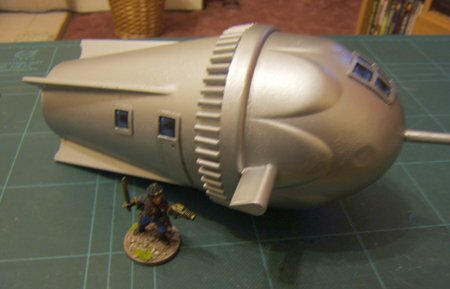 I plan to re-paint it and load it up with a bunch of extra luggage like the vehicles from Disney's Atlantis. It had three screws holding it together so I took it apart. 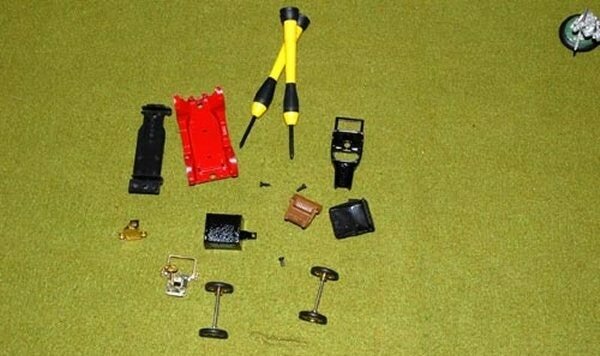 Then I stripped the metal parts. I stripped it with fingernail polish remover. Next time I'm just going to try paint stripper although the polish remover got it pretty clean. 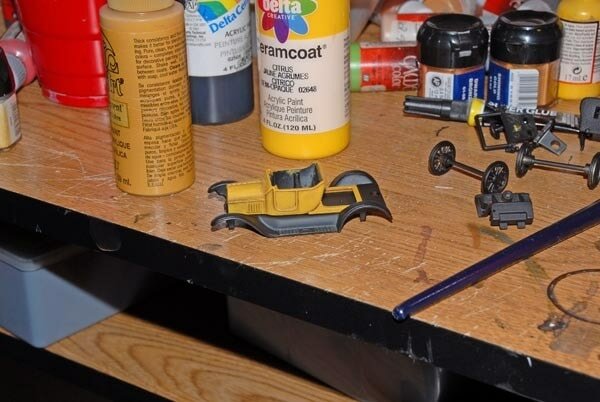 I use a brass wire brush to strip metal be they pewter figs of something else. It took me a few hours to work this stuff down. I let it sit for about an hour then scrubbed as much as I could then put it back in. I did that two or three times. I primed everything but the tires with black Dupli Color Sandable Primer which is currently my primer of choice. It's super smooth, holds detail, and covers nicely. 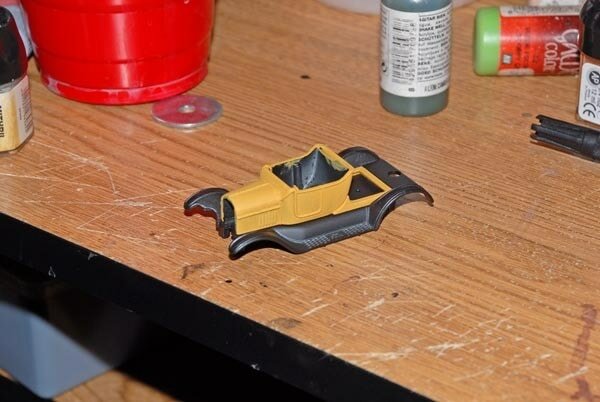 Base colors painted on. 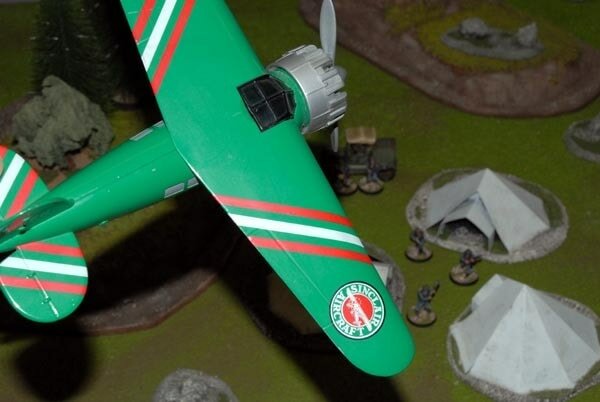 That’s Model Master Dark Green. Ok here it is with a dark brown wash.
After the wash I highlighted all the colors with two or three highlights starting with the base color as the first highlight. As you can see it's mostly done other than the headlights and whatever marking I decide to put on it if any. I'm considering putting U.S.M.C. on the trunk and a number on the doors but I'm not sure I want to mark these trucks with anything as that would cut down on their flexibility for gaming. 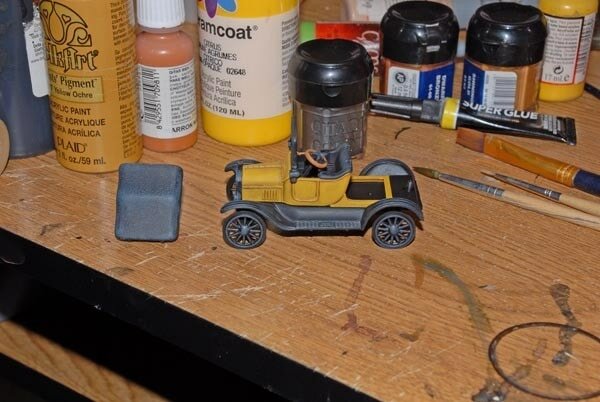 I plan to put the top back on after I finish varnishing so as not to rub the paint off the top of the windshield frame. Here are the last two WIP shots. It's on the varnish table now so it's in the "done for now" category of projects. I think I'm going to go pick up the others they had at the junk shop and make a few more variants. 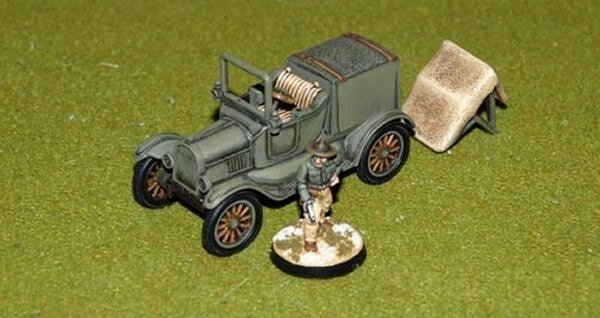 Ok here is the finished truck. Someday I'm going to add a luggage system that I can add and remove as I need it. 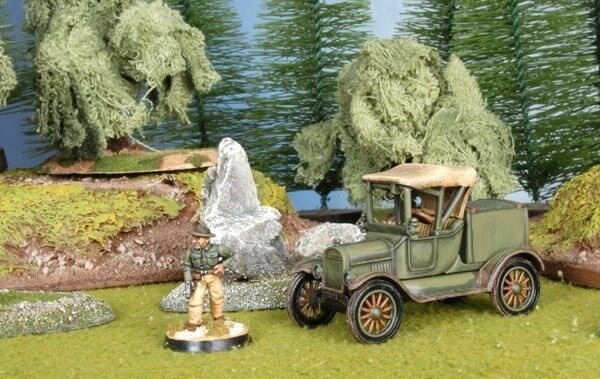 The figure show with the truck can be purchased from Pulp Figures In this pack: PYS 8 - U.S. Marines/Tropical/Montana Hat 1. 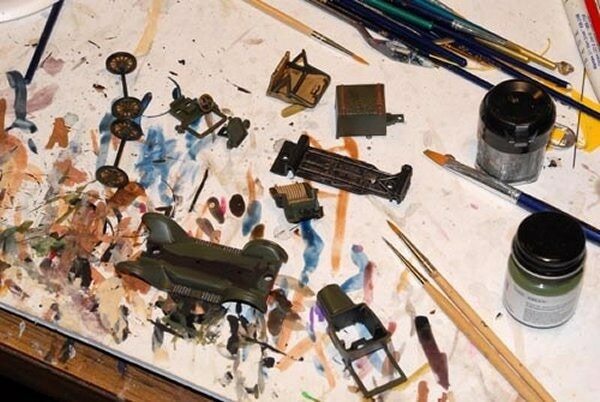 But, I'll warn you, it will lead to hours of miniature troop reviews and and crazy shouting while you move a little man back and forth across your miniature shelf. My Bretonian Knights have never done so many push ups. "What is that on the top of your helmet soldier? A little deer? You think a little deer is going to help you fight better? You’re a disgrace to the uniform! Now drop and give me 50!". 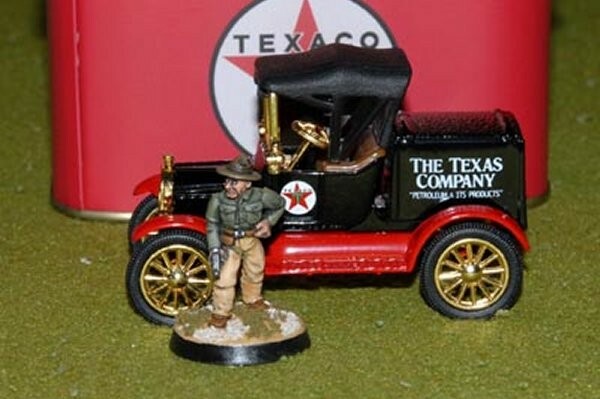 The 'out of the box' paint scheme. 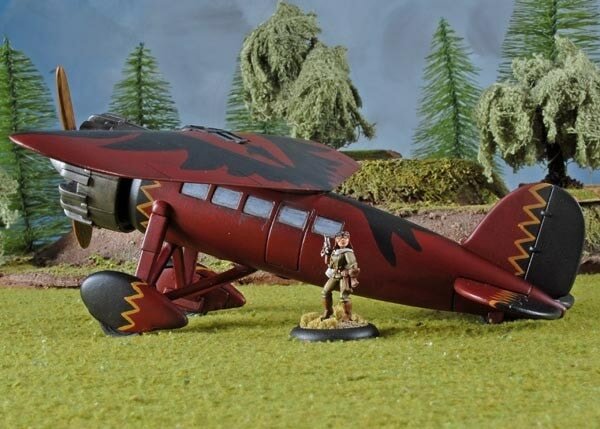 Well It's time to re-paint my Lockheed Vega for my "Blackfeather" Pulp serial game. 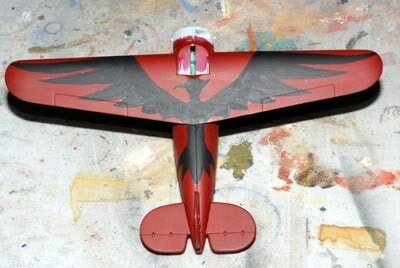 The paintjob will be red and it will have a stylized black crow with outstretched wings on the top. Hopefully it will turn out as nice as my truck. 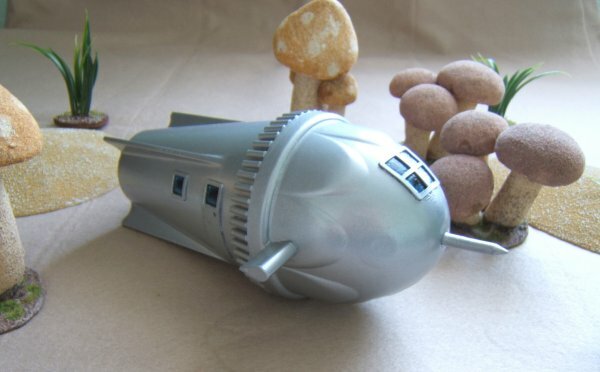 This model isn't very accurate but I'll try to make it look as nice as I can. 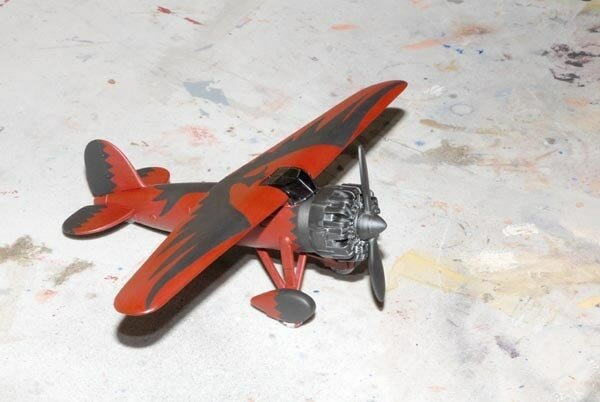 Here is a picture of the model stripped of it's paint. I used a citrus based stripper brushed on. The plastic wheels took a bit of damage but not much. 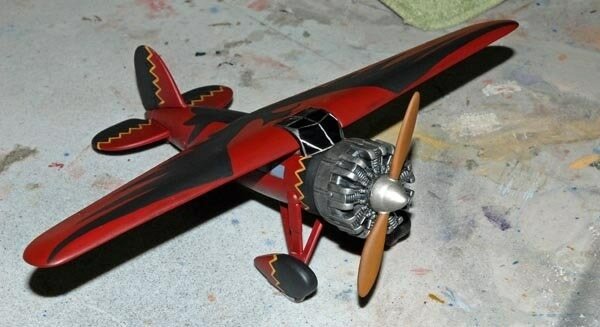 I removed the plastic window and engine to strip the paint. Ok well a stripped plane isn't that interesting I know but it did take some time to strip it and prime it so that's about all I got done on the first night. 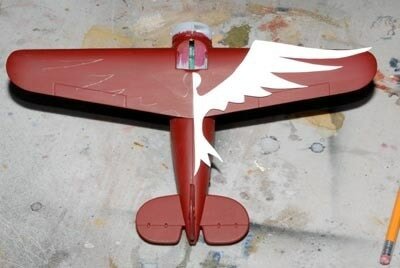 No need to show the primed plane either since it was just primer grey. Here is the Vega painted red. 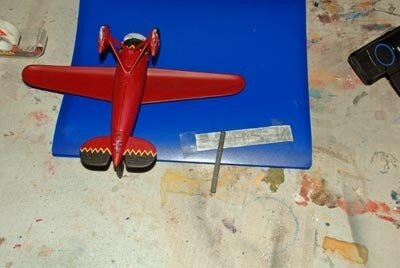 I chose to hand paint the plane red using about 4 or so thin coats. I like the slight variation of the hand painted surface over a smoother spray painted surface. Vegas were made of plywood and the fact that this plane is diecast already makes it look a bit smoother and more uniform than it should. 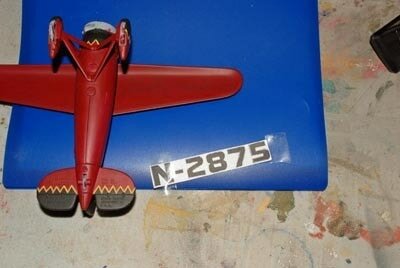 Also the pics I've seen of older planes make a lot of them look hand painted. 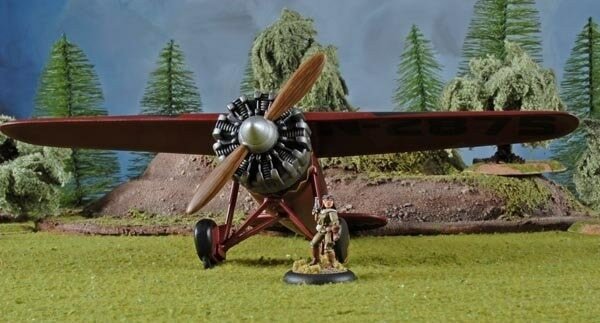 The next task was to go ahead and tackle the main decorative feature of this plane. 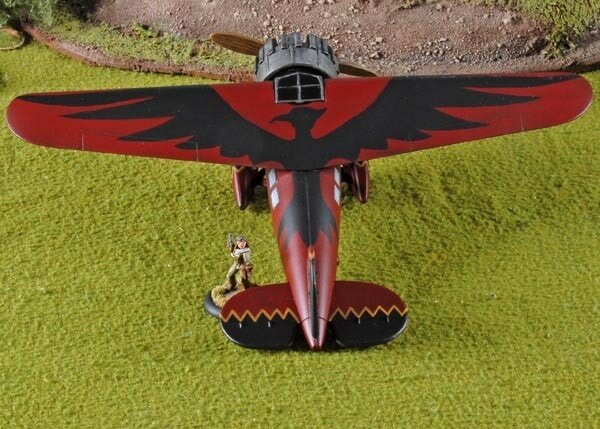 I wanted to have a stylized crow with it wings spread out over the top of the plane and wings. I made a basic half template to trace around. After tracing around the left side I flipped my template over and traced the right side. Then I drew in the beak and feather tuft on the head. then I painted it in with black. I still have some touch up to do here. 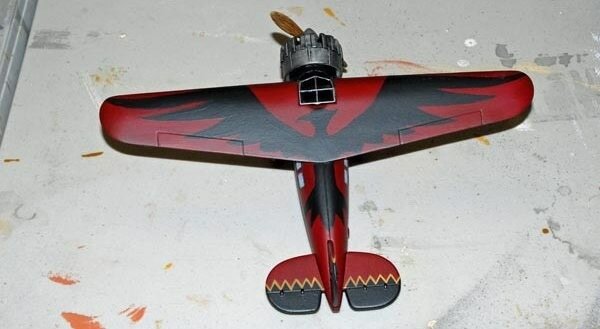 I'm also going to add some highlights before I'm done to bring out the crow more but I'll wait to do that after I finish laying in some more detail and give the model a light wash. Most of the basic decoration is blocked in here in black. 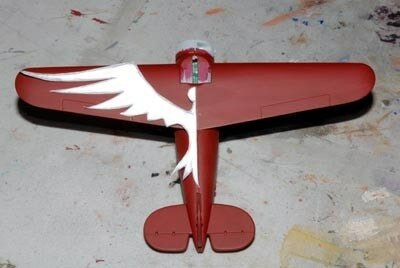 The black designs on the spats, tail, and nose will be outlined in yellow, also the windows will be painted in as well. I finished the yellow outlines and painted in all the windows. Here are shots from two angles. 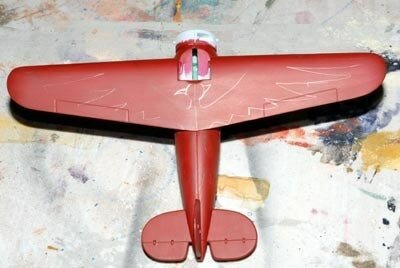 I still have to put the identification numbers on the underside of the wing and add a few more details to the body of the plane then finish the engine and prop and the canopy. 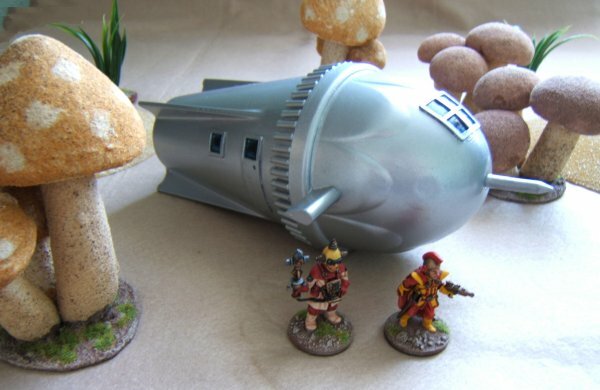 Here's the Vega with a 28mm figure for scale. 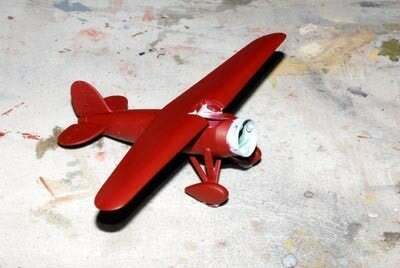 I drybrushed the engine then painted the propeller and nose cone. 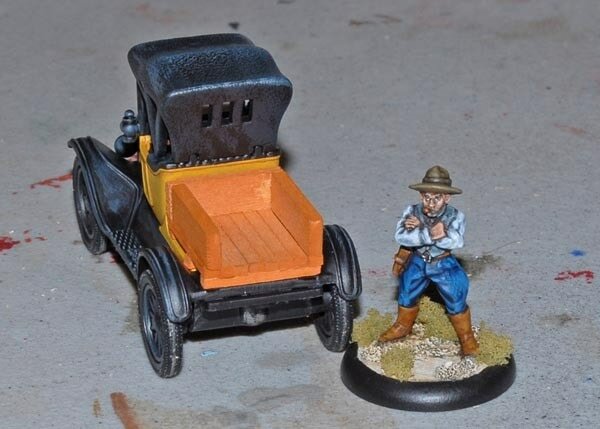 After that I only had one major detail left other than the wheels which I'm painting at the very end because of their tendency to get stuff on them. I did a bit of research on registration numbers then promptly forgot the information. I think it should read NC-2875 but for some reason or the other I forgot that when I got started and just used N-2875. It's not really enough of an error to go back and fix as far as I'm concerned. I basically did a carbon transfer from a print out of the numbers. I made my own transfer by using a stick of willow charcoal to cover the back of the printout with black carbon. You can use pencil but charcoal won't bleed through the paint like graphite will. It's hard to see the transfer in these photos but it came out very clear. To make the transfer you just tape the paper down lightly and trace the image you want to transfer. After I made the transfer I just painted in the letters. Now I'm down to weathering and paint detailing. I'm not really sure how to go about it. 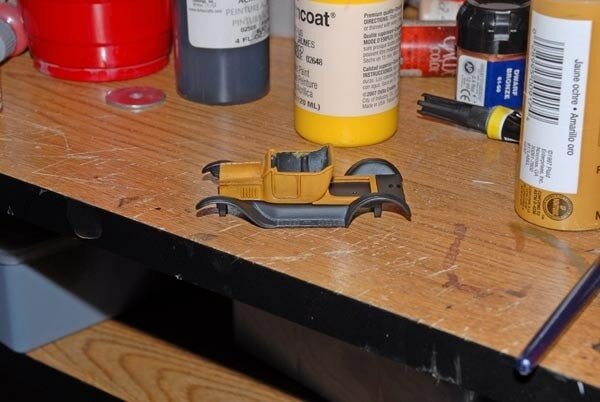 A few months ago I did the truck pictured here using almost exactly the same methods that I have with this plane but the truck has a low more surface detail whereas the plane has large smooth surfaces. I went ahead and did a light wash which did help enhance the details but it also just looks a bit muddled in some places. 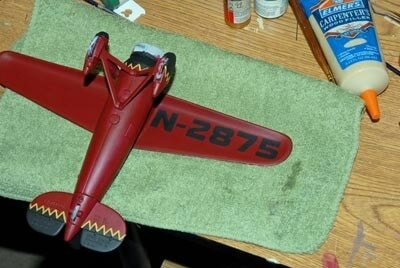 Then again I want the plane to look in use but well maintained so a bit a gunk is ok. I'm at the point now where I need decide about highlighting and other weathering techniques but I'm not entirely sure where to start. 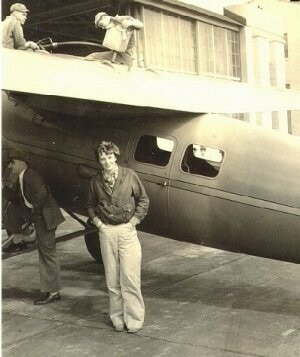 Here's Amelia Earhart next to her Vega. Even accounting for her height you can see how tall my Vega is compared to the real thing. Also the windows and doors are somewhat larger on the model. Still I think it's a pretty nice match for game use. 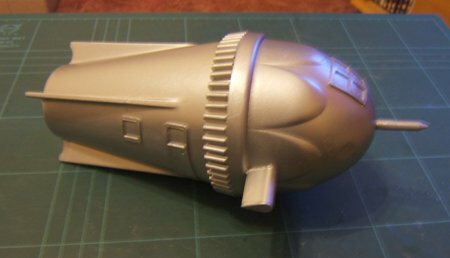 I chickened out on doing much weathering. I mostly focused on the windows and the door. 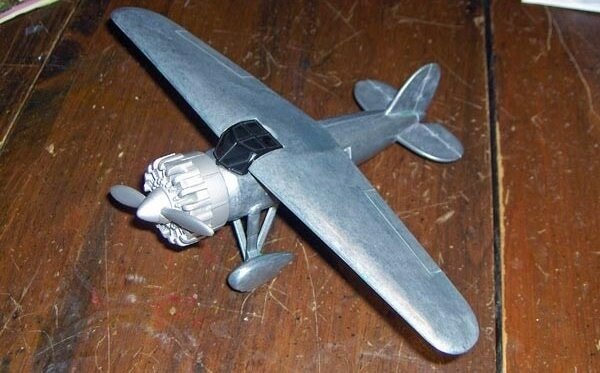 The propeller turned out pretty good.